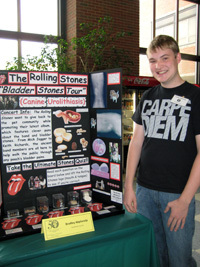 "The Rolling Stones help present a 'Bladder Stones Tour' to teach the public about Canine Urolithiasis. Inspired by my beagle Alex who had a large struvite stone in early 2008; today she is healthy and enjoying life." 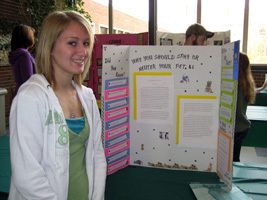 "My poster talks about the causes, symptoms, physical findings and treatment of facial paralysis. 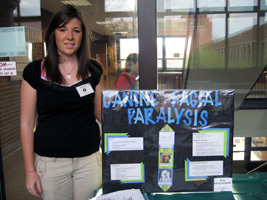 I got the idea to do facial paralysis because my dog was diagnosed and I wanted to find out more information." 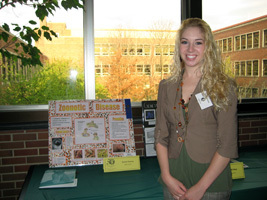 "My poster is about how certain diseases affect animals and where they come from. I also list how to prevent these diseases by either vaccine or pill." "My poster is a teaching aid which I will use in my local goat club to teach our younger members the many different and diverse breeds of goats in the form of a game." 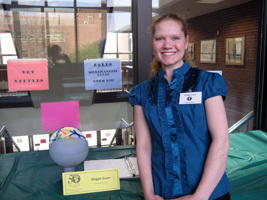 "I chose the cell because during biology in high school the most difficult thing I had to learn was the CELL both the physiology make up and anatomy. 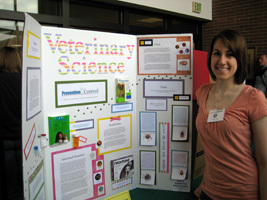 Doing this project helped me learn and remember a whole lot easier then reading from a textbook." 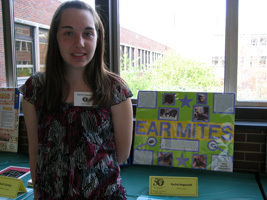 "My poster is a teaching aid to help younger kids learn how to diagnose and treat ear mites in both dogs and cats." 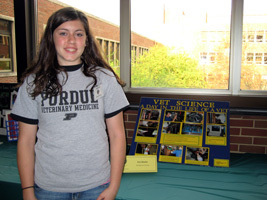 "My project was to inform people of the importance of spaying or neutering their animals. I collected facts, wrote a paper, and made my teaching aid about this fact because I feel it's an important issue that people need to pay more attention to." 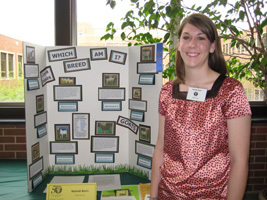 "I created my project due to a conversation I had with a Great Dane breeder who helps me train my dog in 4-H. 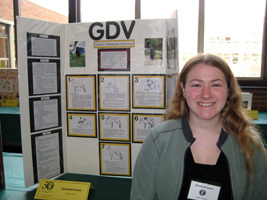 I found out that GDV is very serious and can affect any dog or cat." 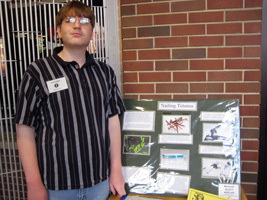 "The project I chose was a study of tetanus. I felt that due to past experience with the disease, it would be a good topic for a project. Tetanus is a disease that generally comes about through puncture wounds or other types of deep wounds. Tetanus has to be in an oxygen free environment to thrive. The project also included the death rates for animals and people that die from tetanus." 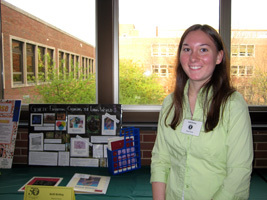 "My project encompasses the ideas involved in genetic engineering, its applications in the agricultural animal community, and why scientists use animal models to chart disease formations. Also includes a teaching aid for students to learn about Punnett Squares, 'Punnet Square Game'." 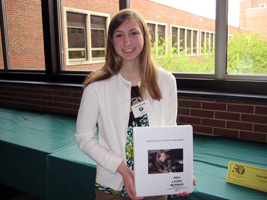 "This project was a great learning experience for me. My dog was diagnosed with this disease recently and I really was interested in learning more. Periodontal Disease is caused by bacteria that destroy the tissue surrounding the teeth. Left untreated can cause many problems internally as well. The best prevention is routine dental cleanings and home care like brushing your dog's teeth!" 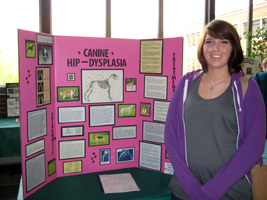 "My poster shows some of the things that a large animal vet does on a daily basis. It also shows some of the tools and equipment that a vet uses. It also shows me and a vet draining an abscess on my brother's 4-H steer." 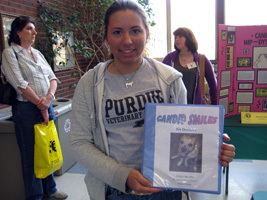 "I chose to put an educational binder together for my vet science project in order to educate others on the importance of pet dentistry. I observed and assisted Dr. J.L. Huffer with multiple dentals. During these dentals I photographed the different stages of periodontal disease. This binder is used as a client-ed tool at Family Pet Heath Ctr." "I made my poster because my dog Duke has this problem. I wanted to learn more about the disorder while educating everyone else." "My notebook is a teaching aid. It follows the journey I took with my dog to diagnose his injury, repair the ligament and bring to full recovery from a torn cranial cruciate ligament." 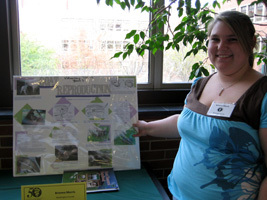 "My poster explains what occurs during the reproduction of goats and problems that can occur during pregnancy." 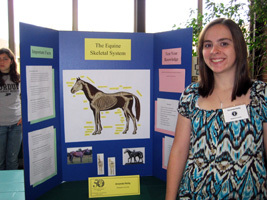 "I chose to create my poster over the equine skeletal system because I was very interested in learning more about it. I learned a lot while doing the research for my project." 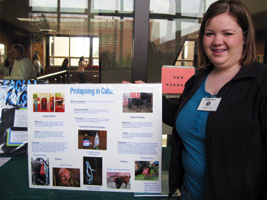 "My poster talks about the different types of prolapsing in cattle. It also talks about the different causes and treatments of prolapses. There are pictures of the different prolapses and the equipment used to help fix the prolapses." 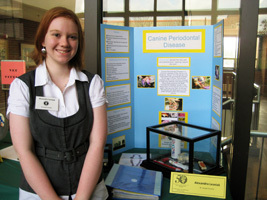 "I created my project to help educate people in rural communities about the dangers of diseases that can be passed between people and the animals they come into contact with."